*Free tours take place on the First Friday of the month, and tickets are required. Tours are limited to 20 people. 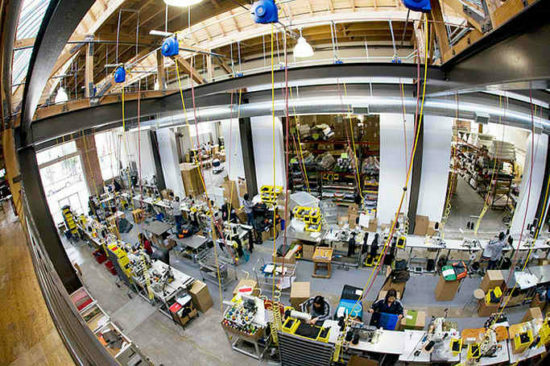 Come down to Timbuk2 Factory and Headquarters for a 60-minute behind-the-scenes look at the product design, marketing, and of course the (spoiler alert) office gong, disco ball and kegerator. Free tours take place at 11 am on the First Friday of the month, and tickets are required. Tours are limited to 20 people. Timbuk2 was born and bred in San Francisco in 1989, and they have been making high quality, durable bags in the heart of The Mission District ever since. They believe in making our San Francisco Factory and how we design, craft and build bags to last a lifetime accessible to the community and their customers. By Bike: Covered, protected bike parking inside our Factory Store. Just roll it on it, we’ve got you covered. By Transit: We are scenic 10-15 minute walk from both the 16th St and 24th BART station. By Private Vehicle: Street parking is limited and has a 1 hour limit. The closest paid parking lot is on Capp St between 19th and 20th St.
*Free, but there is a $5 suggested donation for the optional potluck lunch. *Register through Eventbrite for an extra raffle ticket and increase your chance to win. *Bring cash for food and drinks. No cover charge.